Philosophy is essentially the story of a bunch of mostly white rich dudes with lots of time on their hands to ponder their wrinkles in the mirror. From Socrates to Satre, these men contemplated the great questions like "Why am I here?" and "Why is everyone else but me such an idiot?" (More on that later...) A great quote late in the book: "They were all in privileged positions, and they were able to envision the heavens in part because they did not have to sweep the floor." I went into the book as I think most people would, hoping to pry a little into the greatest minds in history and see if they could shed any light on my own existence. Maybe one of these enlightened beings would really provide me a real answer to "Why am I here? ", the question that I think organized religion and their creation myths fail at badly, and that science may never answer. As the Buddha said, there must be a middle way.. The book opens on the ancient Greeks, and its clear from the beginning that these poor saps really were just shooting blanks in the dark, hoping to hit something. 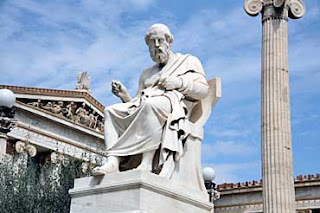 Plato is the most famous of these figures. He uses Socrates as a foil to discuss "Ideal Forms", but basically its the beginning of a long long line of folks guessing wildly about the true nature of reality, and being way off the mark. The main thing to take away from the ancient Greeks is this: you gotta give them credit for trying. They were the pioneers of a new frontier. There were the first in the West to look elsewhere than the gods for answers, to look around with honest eyes and an open mind at the world. And for that I salute them. But what is remarkable to me is that a hundred years before Socrates was killed for his heretical beliefs, three of the greatest philosophers ever were roaming the East at the same time. Their names were Siddartha Gautama, Confucius, and Lao-tzu. 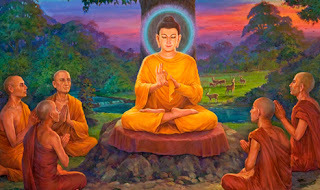 The story of the buddha has become familiar to many in the West today, but still in terms of philosophy he has to be mentioned apart. He was a rebel, an aristocrat who rejected the standard Vedic teachings and gave it all up to become a true seeker of wisdom. That is the very definition of a philosopher. Although the authors claim that Aristotle was the greatest philosopher, I completely disagree. Today its clear that Buddhism and the ideas of Siddartha, formed 2500 years ago, better stand the test of time. PS: What did Buddha order when he walked into McDonald's? "Make me one with everything." I remember my first trip to Thailand and seeing all the buddhas and thinking that I wanted to go to India someday to see the place where it all began. So then I went. I always thought of Eastern religions as calm and spiritual and to then go to their country of origin and find chaos and more chaos was a surprising dichotomy. Nonetheless, I found is astounding how many (billions?) follow these religions and yet how little influence they have in the West.